JAMES MONROE. 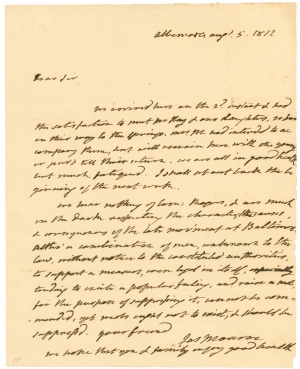 Autograph Letter Signed as James Madison’s Secretary of State to an unidentified friend, Albemarle [his home], Virginia, August 5, 1812. 1 p.
…We hear nothing of Com[modore John]: Ro[d]gers, and am much in the dark respecting the character, the causes, & consequences of the late movement at Baltimore. Altho’ a combination of men, unknown to the law, without notice to the constituted authorities, to support a measure, even legal in itself, tending to excite a popular feeling, and raise a mob, for the purpose of suppressing it, can not be commended, yet mobs ought not to exist, and should be suppressed. Beginning with the first day of hostilities of the War of 1812, on June 18, 1812, the war provoked passionate pro- and anti-British sentiments in the hearts of Americans. The government’s position, represented here by Monroe as Secretary of State, was vociferously opposed by the Federalists whose viewpoint was espoused by the newspaper The Federalist Republican, published in Baltimore by Alexander C. Hanson, the grandson of John Hanson, and by Henry ‘Light Horse Harry’ Lee, noted Revolutionary War general. Their position, clearly supporting Great Britain, was published in the issue of July 27, 1812. On the following day, July 28, an unruly mob, declaring Hanson and his supporters traitors, attacked the newspaper office. Hanson, Lee and their few adherents were rushed to a local jail for their own protection, but the next day the mob broke into the jail, killing one of the newspaper employees, injuring Hanson and severely and permanently injuring General Lee.